Do you know what SystemTable is? SystemTable might have been introduced to you as a legitimate application/extension, and you might have installed it onto your Google Chrome web browser willingly. If that is not the case, the suspicious adware (advertising-supported software) must have been installed by accident. Can this adware slither in without your knowledge? We do not have information that would support that, but we know that careless users often install programs they know nothing about, and they often trust software bundles that carry multiple questionable programs and add-ons at the same time. So, were you careless when installing something new? If you were, we hope that you are more cautious in the future because you do not want to be the one responsible for letting in seriously dangerous malware. Do you need to remove SystemTable because it is malware? Not exactly, but we do recommend deleting this adware. Do you know the risks of interacting with potentially misleading and unreliable advertisements? There is a good chance that SystemTable shows exactly that. If you carelessly click on these ads, you can be routed to malicious websites or exposed to malicious installers. You could be scammed, and personal information could be extracted before you even realize what is going on. You could also be tricked into thinking that the shopping deals you are offered are beneficial, when, in fact, they could be created for the benefit of unknown parties. Ultimately, if you want to save money, you have to do the work yourself, and we are sure you can find the best deals once you delete SystemTable and other suspicious extensions that might promise to find the best shopping offers automatically. Remember that these extensions work with certain vendors and advertisers, which means that the services are biased. Do you want to remove SystemTable? We are sure that you do if you have found this article already. Also, you must be tired of the avalanche of strange and intrusive advertisements presented by this adware. If you wish to delete SystemTable manually, you can follow the instructions below. Even if you are inexperienced, you should have no trouble following the steps. Of course, this should be your last option, and we recommend installing anti-malware software. Although it should not be difficult to erase adware, you want to make sure that all other threats are eliminated at the same time, and you also want the protection of your system and browsers reinstated. If you choose to take on the task yourself, make sure you scan the system to check if you need to erase other threats. Click More tools to expand a menu. Click Extensions to find adware. Install a trusted malware scanner and perform a full system scan. 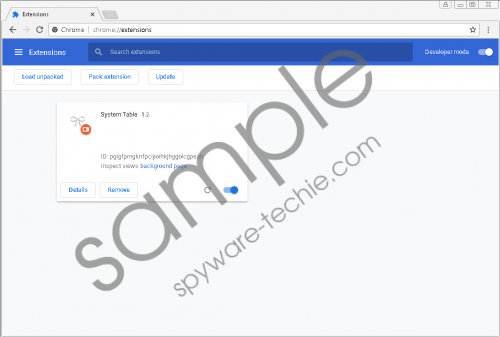 It does not matter how SystemTable was introduced to you because it is most important how this adware works, and our research team warns that it can showcase all kinds of advertisements on any website you visit. The ads can showcase installers, surveys, shopping deals, and other kinds of offers, and we do not recommend interacting with any of them. Why? Because that could put you at risk. You do not want to put your virtual security on the line for a program that, allegedly, can offer you to save a couple of bucks, do you? If you do not, go ahead and delete SystemTable. You might be able to do it manually, but we advise implementing anti-malware software because it can simultaneously erase all threats and protect your system against malware attacks in the future. Tags: delete SystemTable, remove SystemTable, SystemTable.